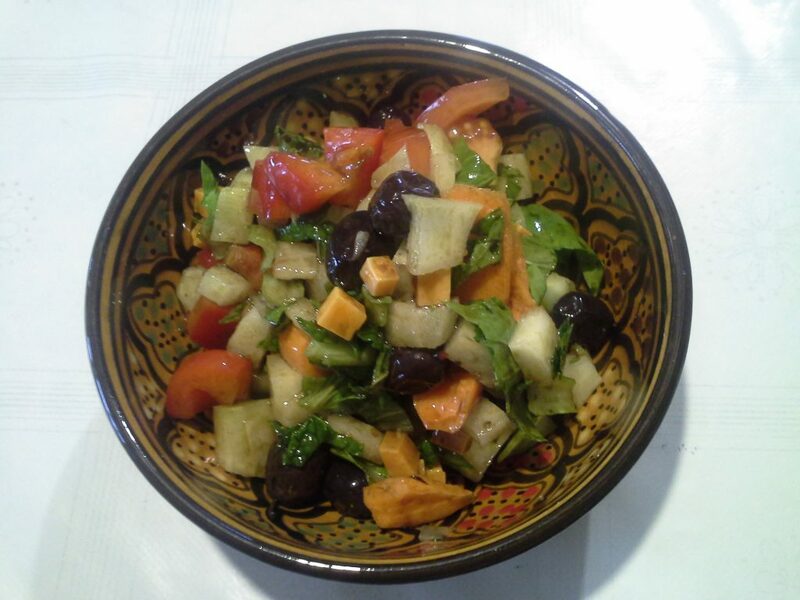 When I feel that autumn makes me sleepy or less energetic, then I can always refresh my energy by this simple salad. You can do the same. You will need a few ingredients that are still available in a supermarket. One spoon of good olive oil, Tunisian olive oil is the best, but any other good quality Italian olive oil will be fine. Cut vegetables and cheese into small pieces, add olive oil, vinegar, oyster sauce, mix well and enjoy the exquisite taste of the East&West salad. For a better look one can use a nice Berber bowl – like the one on the photo. Remember, Turkish black dry olives usually have seeds, so eat slowly. VARIATIONS: For a change olive oil can be replaced by pumpkin oil (taste will be very different), cheese can have more or less sharp taste (I prefer very sharp), a few drops (remember drops only) of chili oil or a piece of green chili can be added. Mint can be replaced by fresh basil. Black olives can be replaced by green but the taste will be milder.